The Point Sur Lighthouse is possibly the most scenic light on the California coast. If you have ever driven along the Pacific Coast Highway between Carmel and Big Sur, you may have seen it sitting atop a rocky point 361 feet above the cold Pacific Ocean. You can see it from the highway any time. That is when the highway is open. If you want to travel on Highway One and need to know what to do if there is a closure, you can find everything you need to know and alternate routes in the guide to coping with the Highway One closure in Big Sur. Unfortunately, this fascinating piece of maritime history is only open during guided tours. Check the tour schedule on the Point Sur Lighthouse website. Shortly before your tour, line up in your vehicle on the west side of the highway, north of the gated entrance. Your tour guide will greet you and lead the group in a caravan to the base of the rock, where you park during the tour. Point Sur is a light you don’t want to miss, but getting all the way there can be challenging. After you drive in and park, you'll have to walk. The top of the secluded volcanic rock is 360 feet above. You will also have to climb two sets of stairs, the longest having 61 steps. If you have mobility issues that are of concern, call California State Parks at 831-667-0258 well in advance to see if they can accommodate you. Wear sturdy, comfortable walking shoes and bring an extra layer or two of clothing. It may be much colder at the lighthouse than it was in town. Leave your pets at home - they can't go on the tour, and you won't be allowed to leave them in your car. And if you have little ones along, you'll have to leave the stroller behind. If you're going to visit the lighthouse, you could easily spend a few days exploring more of the beautiful Big Sur Coast. The tower at Point Sur Lighthouse was first lit in August 1889. It has remained in continuous operation since then. Building it was no small task. It cost more than $50,000 in 1889 which included constructing a temporary railroad track to carry materials to the site. Later, they put in a tramway and finally, a roadway was cut through to the summit. Only four light keepers ever worked at Point Reyes. Several shipwrecks have taken place on or near this national landmark. But the most notable nearby wreck isn't a ship at all but the US Navy Dirigible MACON, which sank in 1935. Exhibits on site tell its fascinating story which has ties to that giant hangar building at Moffett Field in the San Francisco Bay. In 1974, the small light station at Point Sur was automated. Point Sur Lighthouse is on the National Register of Historic Places. It's also a California State Historic Landmark. The outbuildings are being restored to look like they did at the turn of the 20th century. 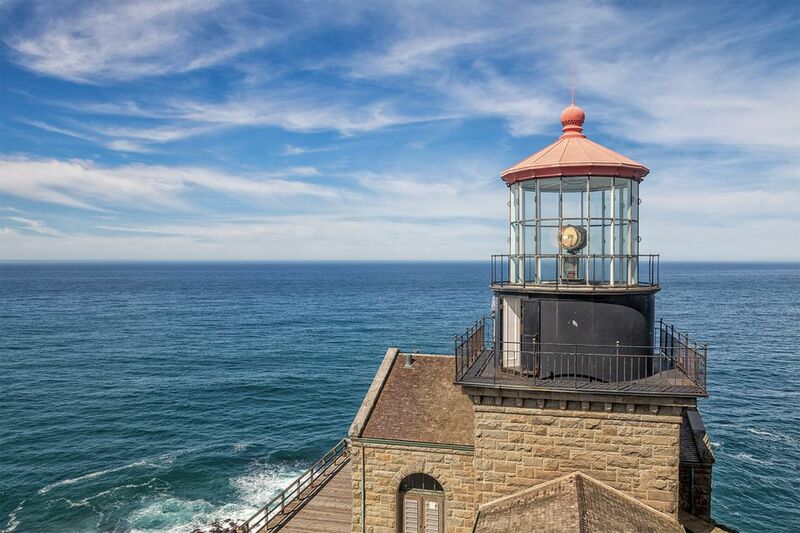 According to the Carmel Pine Cone newspaper, the Point Sur Lighthouse may be haunted. Ghost hunter Julie Nantes says it has 18 or more resident spirits. If she's right, that makes it one of the ten most haunted lighthouses in the United States. All I can say about that is that we didn't meet any of them when I visited, but what do I know about ghosts? The lighthouse is open only for guided tours (weekends in winter, extra weekdays in summer). It's a much nicer thing to do on a sunny day. They don't take reservations. It's first-come, first served and all you have to do is pull off the highway near the entry gate. Tour guides lead their groups inside the gate by car, and then you walk to the lighthouse. Allow a few hours for the visit and tour. Point Sur Lighthouse is on CA Hwy 1, 19 miles south of Rio Road in Carmel, at mile marker 54.